I am not a weather nerd. I don’t commute to work and I don’t need to know the percentage of precipitation and humidity for the next three weeks. I spend most of my days in Viterbo and Rome, where the weather isn’t particularly crazy; I never get to try the fancy weather apps with Dark Sky integration and “radars” because those features don’t work here. You may argue that I’m forced to be a casual user of weather apps; I honestly believe that I don’t need to know everything about the weather to have a good day. I don’t travel much, and therefore I rarely need to plan my trips according to weather conditions. I enjoy simple weather apps like Today, Yahoo Weather, and even Apple’s built-in Weather app for iOS 7 because they display all the data I need without overwhelming me with terminology I don’t understand. This is why I was curious to try Ryan Jones’ Weather Line when he emailed me a few weeks back. His pitch was simple: “I had this idea for a weather app, and I’m great at making charts”. Sure enough, I remembered Jones’ work on the iPad mini “price umbrella” chart from last year, and he seemed confident enough in his app to convince me to try it. Weather Line is available today at $2.99 on the App Store, it’s iPhone-only, and it is one of the nicest and most unique weather apps I’ve tried lately. What sets Weather Line apart is how it streamlines weather data to a simple interface element: a line. Weather Line is organized in three views: Hourly, which shows a forecast for the next 36 hours divided in 1-hour time slices; Daily, for a 7-day forecast; and Monthly, for a breakdown of all months in the current year. The essence of the app – and the element that gives it its name – is the temperature line: running across the screen in every view, the line provides a glanceable representation of upcoming weather temperature and conditions. If the line is dropping, chances are you’ll have to grab an umbrella and a coat. What I like about Weather Line’s UI is that the line has been elegantly augmented with icons, color, and text to carry more information: degrees are shown above the line, and crisp icons indicate weather conditions for each hour, day, or monthly average. For nightly hours, the line is dark, but it turns yellow at predicted sunrise time; if there’s rain on the forecast, the line turns blue. I wasn’t able to test this for my frequently visited locations, but I added cities like Dubai and Sydney and watched as the line turned red for extremely high temperatures and purple for wind. There’s something visually intriguing about quickly scrolling the Hourly forecast that keeps me coming back to Weather Line when I need to understand whether it’ll rain or be slightly windy in my Rome afternoons. While I’m used to scrolling hourly forecasts vertically, Weather Line’s horizontal layout is a mix of numbers and graphical elements that are easier to understand and parse. In the Daily view, I can quickly look at the time slice that’s two blocks ahead of the current day and know that is going to be partly cloudy and cold on Friday. There is no learning curve because everybody understands a line, icons, and colors – and that works for how I like to look at weather information. I’m less sure about Weather Line’s lower portion of the interface, where the app displays a Dark Sky precipitation forecast (Weather Line is powered by Forecast.io data -- also by The Dark Sky Company -- and it can be considered a native version of Forecast's Lines view) and a text summary of weather conditions plus other relevant forecast data. The text summary is good: written in plain English (“Light rain starting in the afternoon”), it’s usually a one-line sentence that’s color coded to match the forecast, so that a sunny day will get yellow text and a rainy one will get a blue font. Below the summary, Weather Line displays values for Average, Precipitation, Humidity, Sunrise, Sunset, and Wind. I could easily get by with just Sunrise and Sunset, because I never cared to learn how Humidity affects my body and my surroundings, or how a certain wind speed can be beneficial to the pinwheel I keep on my terrace. The Dark Sky drawer is useless to me because, living in Italy, it’s always empty, as you can see in the screenshots above. In theory, it should display precise rain and snow predictions with a graph that shows precipitation intensity, but, as I said, I end up with an empty drawer due to Dark Sky’s unavailability in my country. This isn’t a big deal, but the app results in having empty space at the bottom that could be used to space out forecast data more. I hope that Jones will consider adding a toggle to disable Dark Sky in a future update to the app. There are several nice design touches that show a thoughtful development process behind Weather Line (the app was designed by Pacific Helm). When switching between views in the segmented control for Hourly, Daily, and Monthly, the current time slice is quickly highlighted by making the icon and temperature pulse on screen; icons for precipitations are filled based on the amount of predicted rain; in the Daily view, nightly data points are located exactly between days to indicate that you’re viewing a nightly forecast. I see Weather Line as a combination of a casual weather app for the average user like me and a more advanced solution for the data nerd who wants to know numbers and other weather stats. 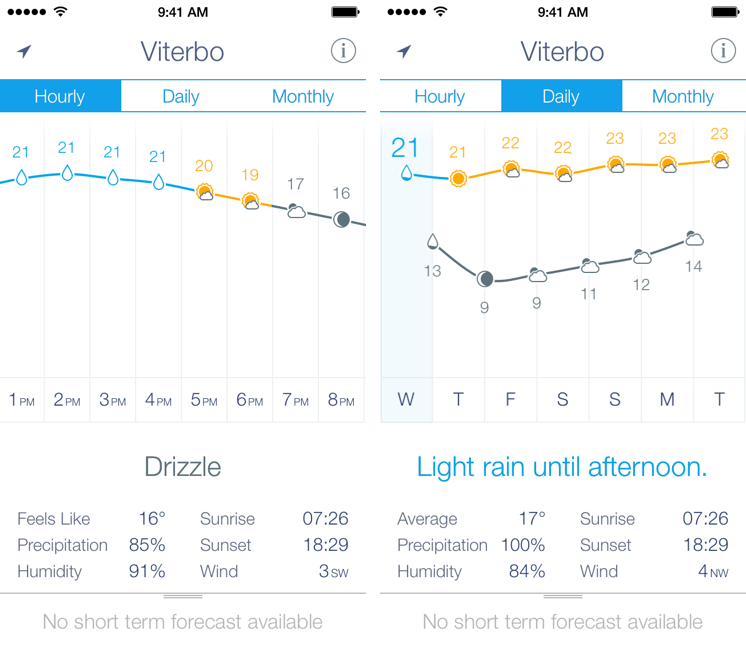 By sitting somewhere in the middle of these two categories, Weather Line can appeal to both kinds of users thanks to its simple but effective design that uses a line to contextualize forecasts. I have been using Weather Line alongside Apple’s Weather, Yahoo Weather, and Today, and, while I still can’t settle on just one weather app, I have been enjoying Weather Line’s design and presentation. In particular, I found myself relying on the Hourly view to quickly visualize temperature and conditions for the next 36 hours, and I appreciate the summary provided by the Daily tab and the text description at the bottom of the app; I'm not completely sold on the Monthly view yet, as I'd prefer having data for four individual weeks rather than a single 30-day block. Weather Line is not for everybody, and there are things that should be improved on a technical level, but it’s fresh and functional, and I like it. 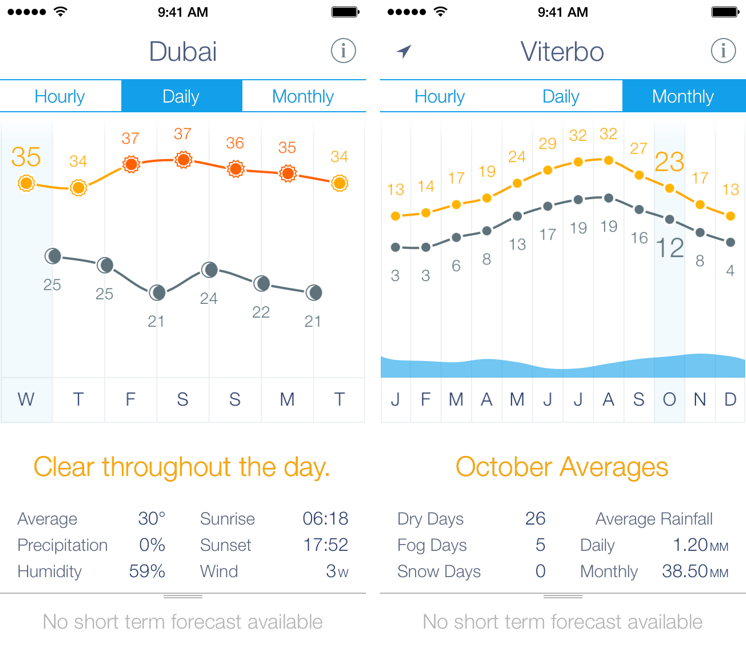 “Designing a chart for weather conditions is completely different. It’s always changing. You have no idea what the data will actually be and there are literally infinite data sets. It takes more gut feel, experience, and trials to get right”, Jones told me last week. And I think that, with Weather Line, he's getting many things right. Weather Line is available at $2.99 on the App Store.